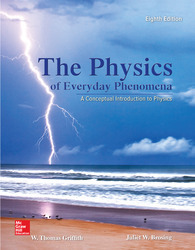 The Physics of Everyday Phenomena introduces students to the basic concepts of physics, using examples of common occurrences in everyday life. Intended for use in a one-semester or two-semester course in conceptual physics, this book is written in a narrative style, frequently using questions designed to draw the reader into a dialogue about the ideas of physics. This inclusive style allows the book to be used by anyone interested in exploring the nature of physics and explanations of everyday physical phenomena. Beginning students will benefit from the large number of student aids and the reduced math content. Professors will appreciate the organization of the material and the wealth of pedagogical tools. McGraw-Hill's Connect, is also available as an optional, add on item. Connect is the only integrated learning system that empowers students by continuously adapting to deliver precisely what they need, when they need it, how they need it, so that class time is more effective. Connect allows the professor to assign homework, quizzes, and tests easily and automatically grades and records the scores of the student's work. Problems are randomized to prevent sharing of answers and may also have a "multi-step solution" which helps move the students' learning along if they experience difficulty. McGraw-Hill Education Connect is a digital teaching and learning environment that improves performance over a variety of critical outcomes; it is easy to use; and it is proven effective. This edition includes over 65 new conceptual questions, several new exercises, and a few additional home experiments. Many of the end-of-chapter exercises have also been revised to refresh the material, while references have been added to conceptual questions to better tie in the concepts from the Everyday Phenomena boxes. New "Debatable Issues" feature provides open-ended, opinion questions on - but not limited to - energy and environmental issues to be used as class discussion, as writing assignments, and/or for internet forums. Much more than just a homework grading system, WebAssign delivers secure online testing, customizable precoded questions from a wide range of math and science textbooks, and unparalleled customer service. Effective pedagogy includes unit openers and chapter overviews that alert students to the most important concepts. Internal summaries clarify and remind students of what is most important. The pedagogy and end-of-chapter student aids, present a learning system to guide students through the course.